Histoplasmosis, a systemic mycosis caused by the dimorphic fungus Histoplasma capsulatum var capsulatum and Histoplasma capsulatum var duboisii is endemic to many parts of the world. The clinical manifestations range from acute or chronic pulmonary infection to a progressive disseminated disease. 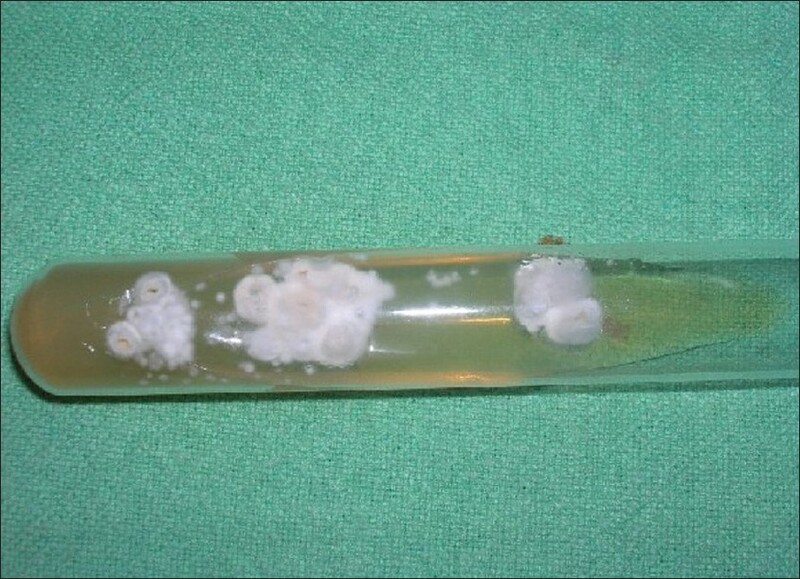 After initial exposure to the fungus, the infection is self-limited and restricted to the lungs in 99% of healthy individuals. The remaining 1%, however, progress to either disseminated or chronic disease involving the lungs, liver, spleen, lymph nodes, bone marrow or rarely, the skin and mucous membranes. Mucocutaneous histoplasmosis is frequently reported in patients with acquired immune deficiency syndrome (AIDS), but it is rare in immunocompetent hosts. A 60-year-old male presented with asymptomatic swelling of the hard palate and crusted papules and nodules over the extremities, face and trunk. Clinically, the diagnoses of cutaneous cryptococcosis versus histoplasmosis was considered in this patient. A chest X-ray revealed hilar lymphadenopathy. Enzyme-linked immunosorbent assay (ELISA) for human immunodeficiency virus (HIV) was nonreactive. Skin biopsy revealed multiple tiny intracellular round yeast forms with a halo in the mid-dermis. Culture of the skin biopsy in Sabouraud's dextrose agar showed colonies of Histoplasma capsulatum. Despite an investigation including no evidence of underlying immunosuppression was found, he was started on IV amphotericin-B (0.5 mg/kg/day). However, the patient succumbed to his disease 2 days after presentation. We report a rare case of disseminated cutaneous histoplasmosis in an immunocompetent individual. The spores of this saprophyte are found in soil and bird droppings. , Pulmonary histoplasmosis and disseminated histoplasmosis involving the skin is very common in patients with advanced acquired immune deficiency syndrome (AIDS). It can be a major cause of morbidity and mortality for these patients. Although histoplasmosis occurs most commonly in immunosuppressed patients,  there are a few case reports of this disease in immunocompetent hosts. , We hereby report a case of disseminated histoplasmosis in an immunocompetent individual from a nonendemic region of central India. A 60-year-old male farmer, resident of Barhanpur (Madhya Pradesh, India), presented with a noduloulcerative growth on the hard palate. He complained of difficulty swallowing for 6 months. He also had numerous skin colored papules and nodules on his head, trunk, and extremities for the past 5 months. He reported that the lesion on the palate started as a small swelling which increased in size over a period of 6 months and then ulcerated. One month after the onset of the oral lesion, he developed a generalized eruption of painful small elevated skin colored papules and nodules. Some of these lesions increased in size and ulcerated. He had a persistent low-grade fever, weight loss, productive cough and shortness of breath for 1 month prior to presentation. On inquiry, he gave history of frequenting caves and forts with other tourists in the area around his home, but there was no history of travel to other parts of India or abroad. He had no history of unprotected sexual exposure, diabetes mellitus, or tuberculosis. He was a chronic alcoholic and a smoker. Physical examination revealed an undernourished, ill-appearing cachectic man with pallor, significant generalized lymphadenopathy, and generalized xerosis. Systemic examination was normal. Cutaneous examination revealed multiple skin-colored umbilicated papules and nodules ranging in size from 0.5 to 1.5 cm distributed on the scalp, face, neck, trunk, upper and lower extremities. A few of these lesions had a hemorrhagic crust [Figure 1]a-b. There was an irregularly shaped, firm ulcerated nodule on the hard palate, about 2 × 2 × 0.5 cm 3 [Figure 2]. Routine hematological parameters were normal except ESR was 50 mm/h and a chest X-ray revealed bilateral hilar lymphadenopathy. enzyme-linked immunosorbent assay (ELISA) for human immunodeficiency virus (HIV) was nonreactive. His CD4 count was normal at 720/mm 3 . Pathology of oral and skin biopsies showed multiple tiny intracellular round yeast forms surrounded by a halo on PAS and GMS staining [Figure 3]a-c. Fine needle aspiration cytology (FNAC) of an inguinal lymph node revealed macrophages containing intracytoplasmic, oval, noncapsulated yeast cells. 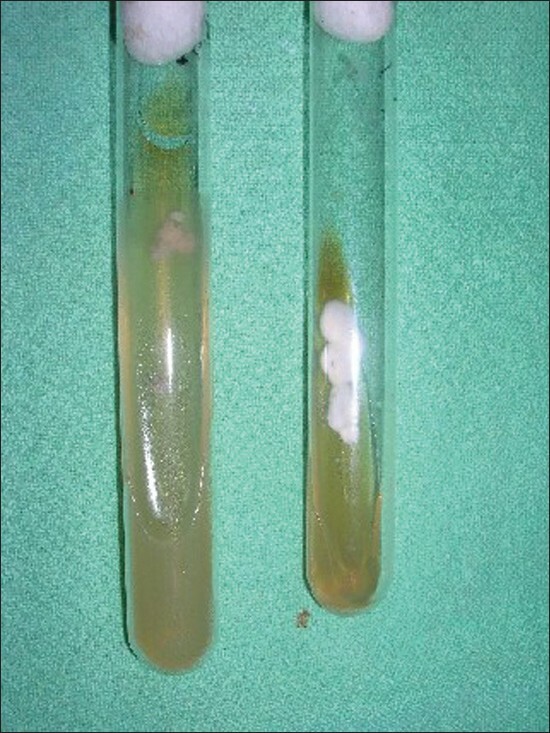 Culture from the skin tissue specimen grew white cottony colonies suggestive of Histoplasma capsulatum [Figure 4]. A test for dimorphism was conclusive for histoplasmosis [Figure 5]. The patient was treated with Itraconazole 400 mg/day for 4 weeks. However, he presented after completing 4 weeks of therapy with new skin lesions, persistent fever, productive cough and dyspnea. On systemic examination, there is decreased air entry on right side with crepitation on further investigation, a chest X-ray showed consolidation of right middle lobe and pleural effusion. He was started on intravenous amphotericin-B (0.5 mg/kg/day). However, the patient succumbed to his disease 2 days later from cardiorespiratory failure. Disseminated histoplasmosis is rare in the immunocompetent host. Histoplasmosis is an uncommon disease caused by Histoplasma capsulatum var capsulatum and Histoplasma capsulatum var duboisii. , In India, histoplasmosis is rare, as it is thought to be endemic only in small regions in West Bengal in western India. , However, sporadic cases from southern India are frequently reported. Our patient was a resident of a nonendemic region of central India,  but frequented many caves and forts that are often inhabited by bats. We believe that our patient contracted the disease via inhalation of conidia of Histoplasma capsulatum present in the soil contaminated by excreta of bats or birds. Inhalation of either fungal conidia or mycelial fragments is the primary mode of infection for histoplasmosis. Once inhaled, these fungal elements transform into yeast forms and may disseminate systemically. Primary pulmonary histoplasmosis in the vast majority (approximately 90%) of cases is asymptomatic or presents with subclinical disease. , Symptomatic hosts with primary pulmonary histoplasmosis often present with nonspecific symptoms of fever, chest pain and cough that are self limited. Immunocompetent hosts are able to control and limit infections of Histoplasma; however, hosts with defective cell-mediated immunity, including patients with hematolymphoid malignancies, solid-organ transplants, and those exposed to chemotherapeutic and immunosuppressive agents, are at risk of developing progressive disseminated histoplasmosis involving the reticuloendothelial system, including the liver, spleen, kidney, lymph nodes, bone marrow and mucocutaneous tissues. It is also recognized as an AIDS-defining illness. Histoplasmosis infection is often categorized as being present in an HIV positive or HIV negative individual, as there are differences in presentation and response to therapy. The major differences are enlisted in [Table 1]. Frequently, in cases of disseminated infection, such oral lesions appear as the initial clinical manifestation. Mucocutaneous histoplasmosis in patients without detectable systemic involvement has been reported. Oral lesions can manifest in a variety of forms, such as ulcers, erythematous or vegetative nodules or wart-like growths. Many reports show development of ulcerating, indurated, and painful ulcers. The palate, gingival, and oropharynx are the most frequent sites of oral histoplasmosis. In nodular or noduloulcerative oral lesions, the differential diagnosis should include squamous cell carcinoma, lymphoma, and other systemic mycoses, in addition to histoplasmosis, irrespective of immune status of the patient. Histoplasmosis should be especially suspected when cutaneous lesions are also present. Our case highlights the occurrence of disseminated histoplasmosis in an immunocompetent patient. 1. Hay RJ, Moore M. Mycology. In: Champion RH, Burton JL, Burns DA, Breathnach SM, editors. Rook/Wilkinson/Ebling Textbook of dermatology. 6 th ed. Oxford: Oxford Blackwell Science; 1998. p. 1363-6. 2. Sanyal M, Thammaya. Skin sensitivity to histoplasmin in Calcutta and its neighborhood. Indian J Dermatol Venereol Leprol 1980;46:94-8. 3. Mukherjee AM, Khan KP, Sanyal M, Basu N. Histoplasmosis in India with report of two cases. J Ind Med Assoc 1971;56:121-5. 4. Gugnani HC. Histoplasmosis in Africa Indian. J Chest Dis Allied Sci 2000;42:271-7. 5. Saoji AM, Grover S, Mene AR, Patoria NK, Sharma KD. Histoplasmosis. J Indian Med Assoc 1976;66:37-8. 6. Nair SP, Vijayadharan M, Vincent M. Primaty cutaneous histoplasmosis. Indian J Dermatol Venereol Leprol 2000;66:151-3. 7. Taylor GD, Fanning EA, Ferguson JP. Disseminated histoplasmosis in a Nonendemic area. Can Med Assoc J 1985;33:763-5. 8. Radhakrishnan S, Vanchilingam S, Subramaniam S, Venkatraman IT. Acute disseminated histoplasmosis with unusual features. An autopsy report. J Assoc Phys India 1982;30:45-8. 9. Rippon JW. The Pathogenic fungi and the pathogenic actinomycetes. 3 rd ed. WB Saunders: Philadelphia; 1988. p. 381-417. 10. Kalter CD, Tschen JA, Klima N. Maculopapular rash in a patient with acquired immunodeficency syndrome. Arch Dermatol 1985;121:1454-7. 11. Sayal SK, Prasad PS, Sanghi S. Disseminated histoplasmosis: Cutaneous presentation. Indian J Dermatol Venereol Leprol 2003;69:90-1. 12. Sharma S, Kumari N, Ghosh P, Aggarwal A. Disseminated histoplasmosis in an immunocompetent individual-a case report. Indian J Pathol Microbiol 2005;48:204-6. 13. Alcure ML, Di Hipólito Júnior O, Almeida OP, Bonilha H, Lopes MA. Oral histoplasmosis in an HIV-negative patient. Oral Surg Oral Med Oral Pathol Oral Radiol Endod 2006;101:33-6. 14. Mendell GL, Bennet JE, Dolin R. Principles and Practice of Infectious Diseases. 4 th ed. New York: Churchill Livingstone Inc;1995. 15. Tewari RP, Wheat LJ, Ajello L. Agents of histoplasmosis. In: Ajello L, Hay J, editors. Topley and Wison's Microbiology and Microbial Infections. 9 th ed. Vol. 4. London: Arnold; 1998. p. 373-93. 17. O'Hara CD, Allegretto MW, Taylor GD, Isotalo PA. Epiglottic histoplasmosis presenting in a nonendemic region: a clinical mimic of laryngeal carcinoma. Arch Pathol Lab Med. 2004;128:574-7. 18. Severo LC. ; Oliveira FM, Irion K, Porto NS, Londero AT. Histoplasmosis in Rio Grande do Sul, Brazil: a 21-year experience. Rev Inst Med Trop S. Paulo 2001;43:183-187. 19. Rocha MM, Severo LC.Disseminated histoplasmosis in patients with acquired immunodeficiency syndrome (AIDS). Study of 25 cases. Rev Inst Med Trop Sao Paulo 1994;36:167-70. 20. Souza Filho FJ, Lopen M, Almeida OP, Scully C. Mucocutaneous histoplasmosis in AIDS. Br J Dermatol 1995;33:472-4. 21. Cobb CM, Shultz RE, Brewer JH, Dunlap CL. Chronic pulmonary histoplasmosis with an oral lesion. Oral Surg Oral Med Oral Pathol 1989;67:73-76. 22. Mignogna MD, Fedele S, Lo Russo L, Ruoppo E, Lo Muzio L. A case of oral localized histoplasmosis in an immunocompetent patient. Eur J Clin Microbiol Infect Dis 2001;20:753-5. 23. Coiffier T, Roger G, Beust L, Quinet B, Adam D, Dupont B, et al. Pharyngo-laryngeal histoplasmosis: one case in an immunocompetent child. Int J Pediatr Otorhinolaryngol. 1998;45:177-81. Sarkar, S., Saha, K., Maji, A., Kundu, A.